While crystalline solar cells are currently the mainstream technology and used in majority of solar panels, some companies choose to develop flexible solar panels. Crystalline cells are fragile and need glass as protection, while there are solar cell technologies, such as thin film cells, that are less breakable and can be encapsulated with a simple plastic and therefore can be flexible. 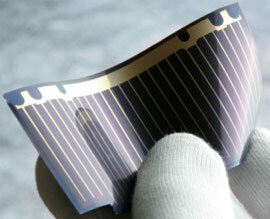 Which technologies are used for flexible solar cells? CIGS cells represents the next generation of thin film solar technology and can be deposited on plastic, metal foil and glass. The general advantage of amorphous silicon thin film is that it generates power already through de-fractioned light, which means it generates power during the early morning and the evening. Besides these two technologies, that have been commercialized, there are other developments in flexible solar products. Researchers at the MIT have developed a technology to print solar cells on a variety of materials, including ordinary paper, cloth and other cheap materials. 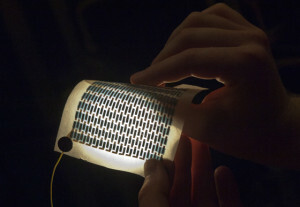 This technology will open a range of possibilities, such as printing solar cells on window shades. MIT revealed exciting tests, such as printed solar cells on a layer of PET plastic, which was folded 1,000 times, and found it would still work. Unfortunately the efficiency is still very low with lab-tested efficiencies of around 1%..
What are the advantages of flexible solar panels? Flexible solar panels are much lighter than convential solar panels, which makes them suitable for different applications. Flexible solar panels can be folded or rolled up, which makes them portable. The major advantage of the flexibility is that these panels can integrated with all kind of shapes. Flexible solar panels can easily take the form of a car roof or can be glued on a metal roof. The strength of this product lies in the multiple integration possibilities. What are the applications of flexible solar panels? The flexible Rollable and foldable panels can be used for a variety of electronic devices, such as to charge laptops, digital cameras, mobile phones and most other electronics. As flexible solar panels are lightweight and portable, they’re also useful for integration with power camping equipment, field communication radios and GPS systems. The printable cells will have an even wider scope of applications, because all kinds of materials can be covered with solar cells. From wall paper, to curtains, these printable cells can change the way solar cells are applied. 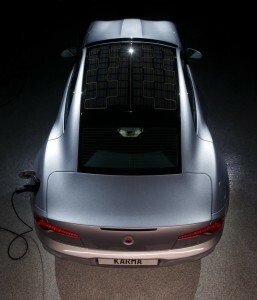 A good example is the solar roof of the Fisker Karma. The integrated flexible solar panel is perfectly curved along the roof of the car. A good example, but what is a solar roof on a car really useful for? Fisker states that the solar cells charge the battery for an additional 4-5 miles of range per week, assuming you’re driving and parking your car in the sun. This is really important post,to me as an electrician. Thank you.